Dillian Whyte-Dereck Chisora II: The perfect fight for the October 28 Joshua-Pulev under-card? 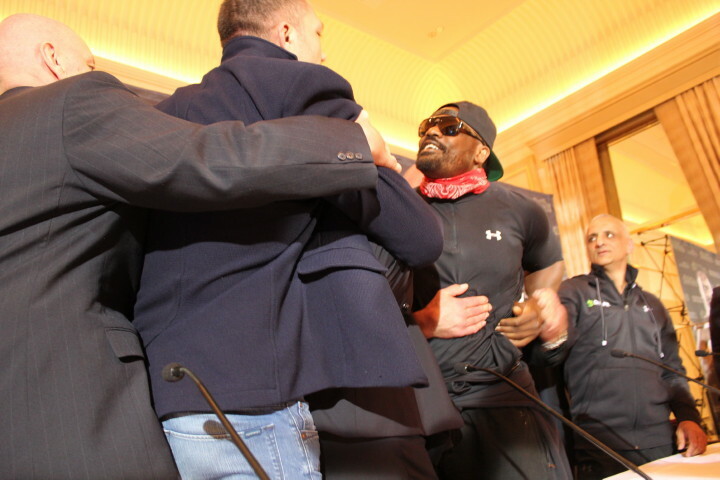 Promoter Eddie Hearn wants it, recently stating how it “has to happen,” the fans sure want it, due to how great the first fight was, and it seems we could perhaps see a return battle between British heavyweights Dillian Whyte and Dereck Chisora – and wouldn’t it be great if we saw it take place on the under-card of the upcoming October 28 fight between heavyweight champ Anthony Joshua and Kubrat Pulev? Whyte, who won his US debut a couple of weeks ago, is already back in training and he tweeted how he is expected to be out again on October 28. It could turn out to be an opponent other than Chisora of course, but this particular British grudge-match needs to happen again, so special was the December 2016 12 round war the two bitter rivals gave us (on the under-card of Joshua Vs. Eric Molina). Joshua has to face Pulev, as the Bulgarian is his IBF mandatory, but in truth, most fans are fully expecting a win from AJ. So, to make the event a value for money affair, Hearn needs to put on a solid under-card – clearly, a Whyte-Chisora rematch would be the perfect ingredient. The two Londoners gave it their all back in December, thrilling the fans, and not only was the fight all-action and therefore deserving of a sequel, it was also a very, very close fight, one that could have gone either way – this too makes a rematch a must-see fight. Could these two possibly give us such a hot, punishing and memorable fight a second time around? Let’s hope we find out, and soon. For although a Whyte-Chisora II would be a fitting fight for top of the bill status, it would also fit in perfectly as the chief support for Joshua-Pulev. The rematch has to happen, Hearn says, so why waste time? If, for example, Chisora did fight someone else next and lost, or if Whyte did so, where would the return of the greatest all-British heavyweight battle in years be then? You are here: Home / Boxing News / Dillian Whyte-Dereck Chisora II: The perfect fight for the October 28 Joshua-Pulev under-card?